The Guardian’s coverage of the incident which occurred on May 31st 2010 on board the Mavi Marmara – an organized effort by the Islamist organisation known as the IHH to break Israel’s blockade against weapons smuggling into Gaza – was characteristically obsessive and one-sided. It included 71 separate pieces (reports and commentary placed on their special Gaza Flotilla page) published on the first four days following the incident and represented a quintessentially Guardian frantic rush to judgement: Israel was guilty of naked aggression against peaceful pro-Palestinian activists. Contrary to a mind-numbing number of accusations in the media that Israel’s blockade of Gaza was “illegal” the Palmer report concluded that the Naval blockade is fully consistent with international law and that IDF Naval forces have the right to stop Gaza-bound ships in international waters. 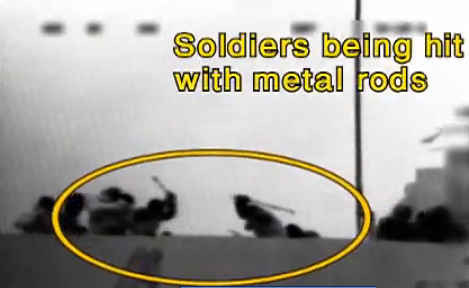 Contrary to claims that the IDF attacked peaceful activists, the reports concluded that when Israeli commandos boarded the main ship they faced “organized and violent resistance from a group of passengers” and were therefore required to use force in order to ensure their own protection. However, the Guardian’s Conal Urquhart – in the great tradition of Guardian pro-Palestinian activists – filed the following story unburdened by such quaint journalistic notions as adjusting a long-held narrative based on new information. In fact, “Israel offers compensation to Mavi Marmara flotilla raid victims” of May 24th 2012, contains one passage completely contradicted by the Palmer Report. It simply doesn’t get more clear than this. A Guardian reporter tells his readers that passengers on that fateful day of May 31st were unarmed, peaceful activists – despite definitive evidence that they were armed Islamist terrorists. I’d recommend Tweeting Mr. Urquhart (@conalu) and asking him about this simply indefensible claim. A pity that column with Assad’s warning was not open for comment – there would be some interesting red faces there. The Grauniad compound the “error” (to put it charitably) in Urquhart’s piece by offering 6 links at the foot of the page to the stories published immediately after the raid highlighting Israel’s perfidy, but no link to any report on the findings of the Palmer Report. It is time for the Western world figures (figurines?) fighting the pro-Palestinian narrative (i.e. bloviating anti-Israel rhetoric) to realize that not only are they lackeys but that they, and not Israel, are the real obstacle for peace. They, and not Israel, are the racist demogogues who deserve to be punished. What a bunch of pathetic jokers. The Grauniad can defend itself by citing another supremely reliable source, the BBC, whose John Humphrys told us on Radio 4’s Today that knives are not weapons (we have them in the kitchen) and that the Israeli soldiers had used automatic or semi-automatic weapons against men, women and children on the Mavi Marmara. A formal complaint about the latter was upheld, against the former was not. So all the Israelis need to do is confine themselves to the use of knives and bars (and pillows? ), following which they will never again be accused of attacking anyone. We’re talking of people sailing in international waters and armed with sticks; facing Israeli commandos in full military gear, heavy weaponry and escorted by military aircraft. Let’s be serious one minute. Eight Turkish citizens and one American citizen were killed in international waters after their ship was attacked by Israeli commandos. This reality cannot be ereased. Armed with sticks, knives, chains, iron bars and probably guns. They were warned and still wanted to mix it with the IDF therefore whatever happened was their fault and that of the flotilla organisers and other assorted idiots who egged them on from the safety of their armchairs.